“In my twenties, I’d been doing a number of oral history recordings, working for the Museum of the Jewish East End which was very active recording stories of the life of Jewish people who had settled here.” explained Alan Dein, broadcaster and oral historian, as we sat together in the yard of the Toynbee Hall while he outlined the background to his fascinating collection of more than a hundred photographs of East End shopfronts. 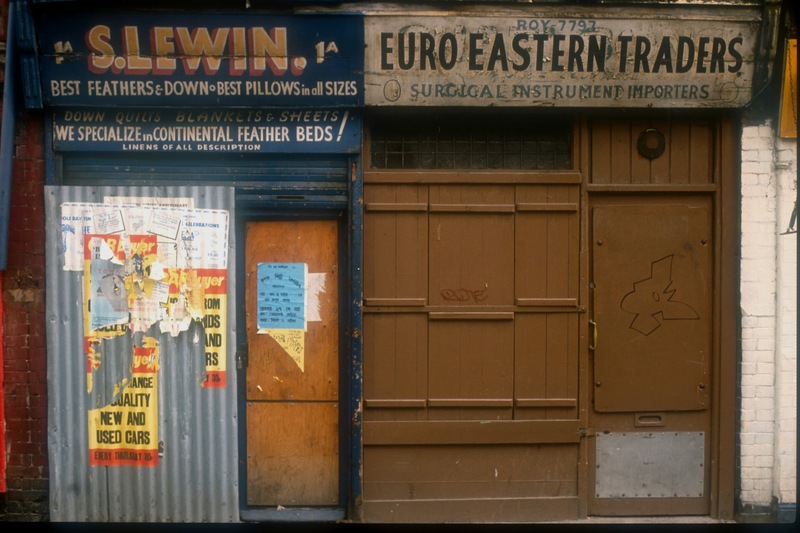 In many of these photographs, there is a visible contradiction between the implicit ambition to present a confident facade and the narrative of disappointment which time and humanity have written upon these once proud frontages. This is the source of the emotionalism in these images, seeing faded optimism still manifest in the choice of confident colours and sprightly signwriting, becoming a palimpsest overwritten by the elements, human neglect and graffiti. In spite of the flatness of these impermeable surfaces, in each case we know a story has been enclosed that is now shut off from us for ever. 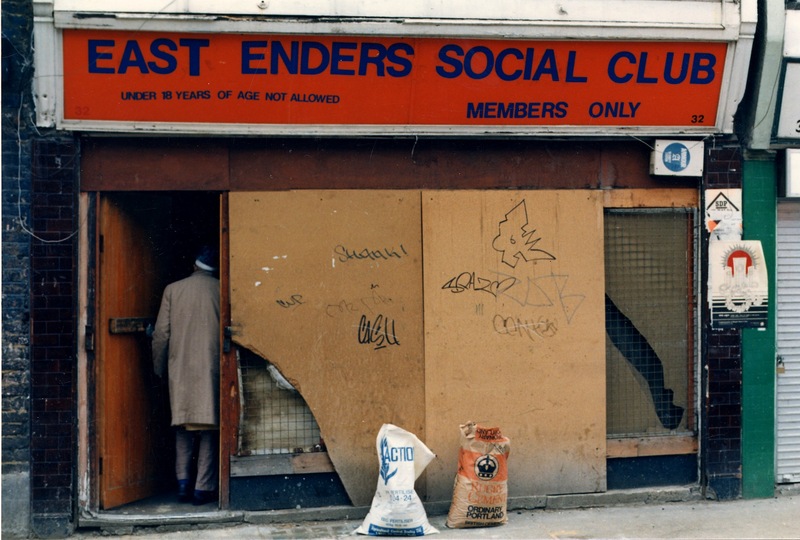 Alan no longer lives in the East End, though today he returns to record oral histories. 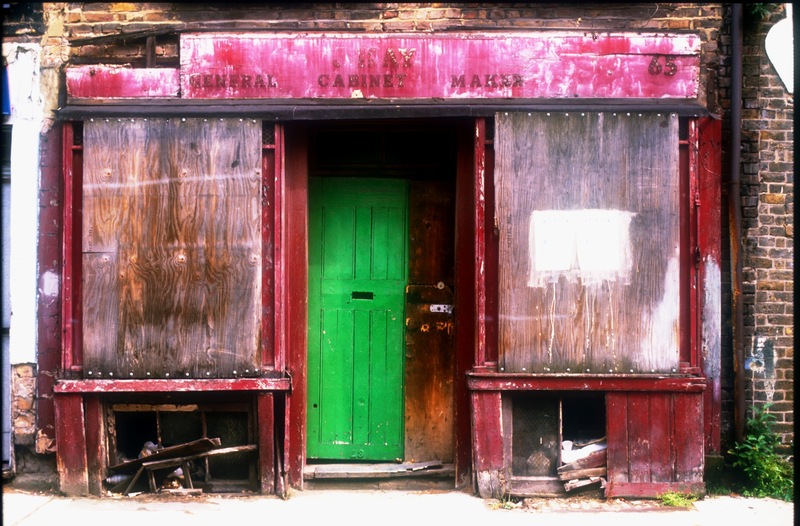 Beyond their obvious importance as an architectural and a social record, Alan’s library of photographs of shopfronts are also a map of his exploration of his own cultural history – their cumulative heartbreak exposing an unlocated grief that is easily overlooked in the wider story of the movement from East End slums to better housing in the suburbs. 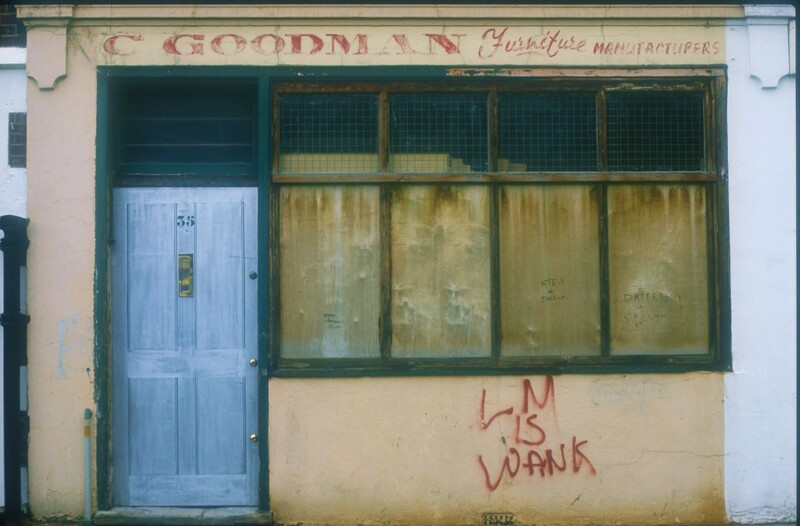 Yet Alan sees hope in these tantalising pictures too, in particular the photo at the top, of Lipmans Kosher Poultry Dealer, in which the unknown painter ran out of paint while erasing the name of the business, leaving the word “Lip” visible. “A little bit of lip!” as Alan Dein terms it brightly, emblematic of the undying resilience of people throughout the turbulence of social change. 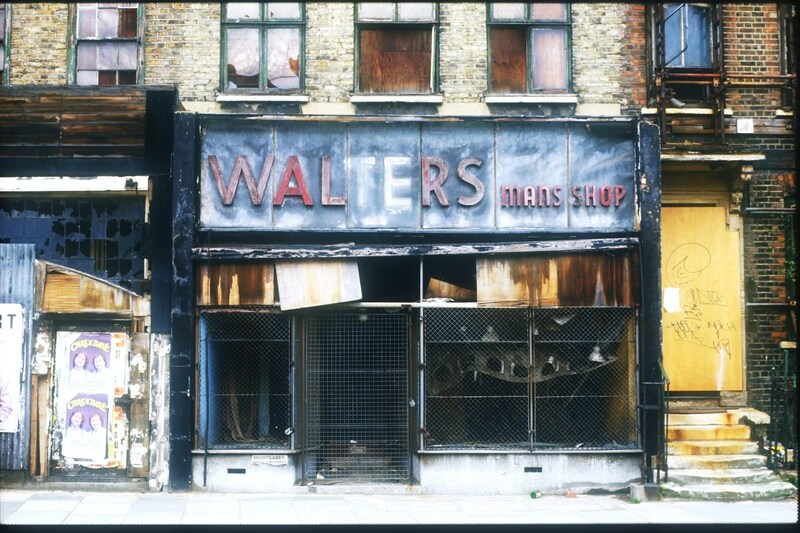 Loved your photos very nostalgic,I used to live in the East End many years ago. 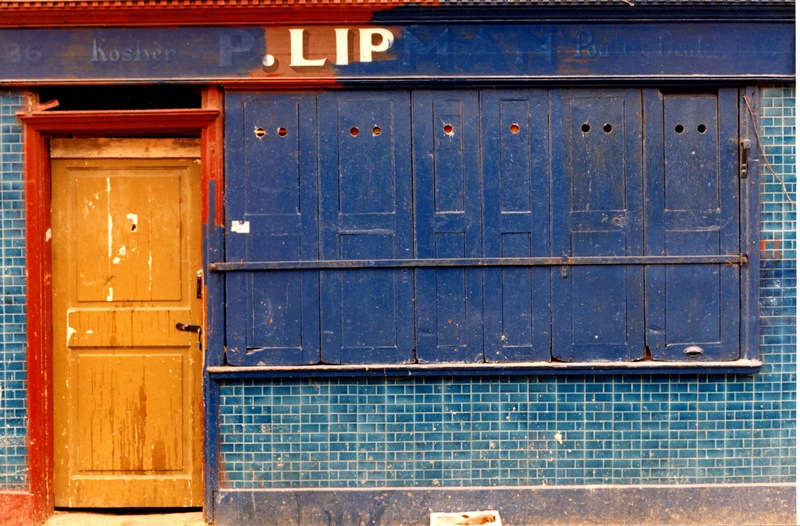 I wonder if you can help me to identify a photo of a shop I took in 2002 in Princelet Street, which on a recent visit I could no longer find. It was a pawnbrokers, proprieter James Castle, with iron railings half way up the window, and what appears to be a blue plaque above it. If it has had a makeover it must have been pretty radical as I can’t find a building that looks remotely like it. Does it ring any bells with you? I would be grateful for any suggestions. About this i can say that Between the cup and the lip a morsel may slip. It’s lovely looking at the pictures. As you probably have guessed from my name, I’m related to the gentleman standing in front of GELKOFF’S, he’s my Dad. He died in 2007, nothing spectacular here. But one of the first pictures in this group is of WALTERS outfitters. That was owned by a good friend of ours, in fact Wally’s wife and my Mum have been friends since about 1921, my Mum died in April 2011, aged 99, and Sylvie is still alive and will be 99 this coming March. Thanks again for all the pictures. reading a newspaper, I remember that shop as if it were yesterday looking at it now brings back so much nostalga wonderful. 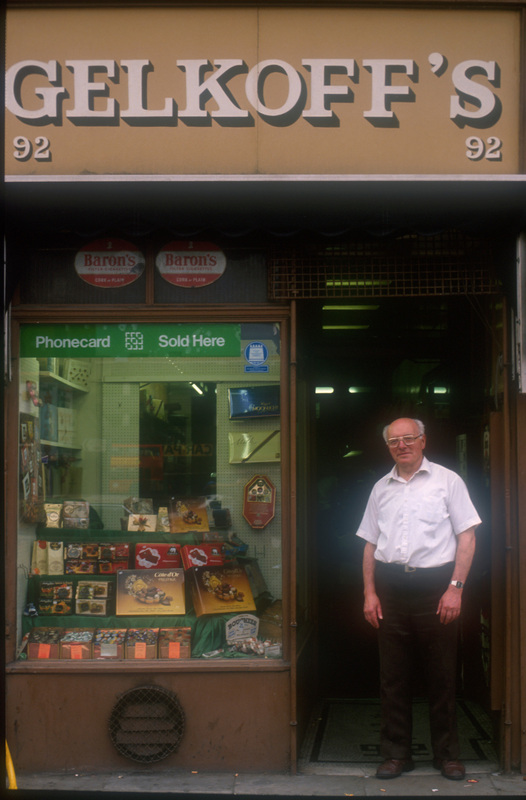 Hi Alan, I’ve really enjoyed looking through your shopfront photos. 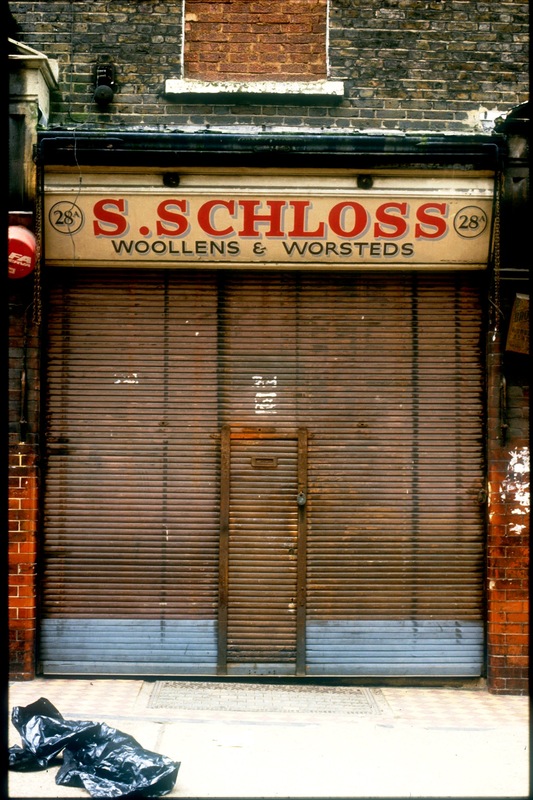 I also always pay attention to old style shopfronts. I like to see when newer shopfront have been removed or shops sold and the older front is still underneath and has been preserved. 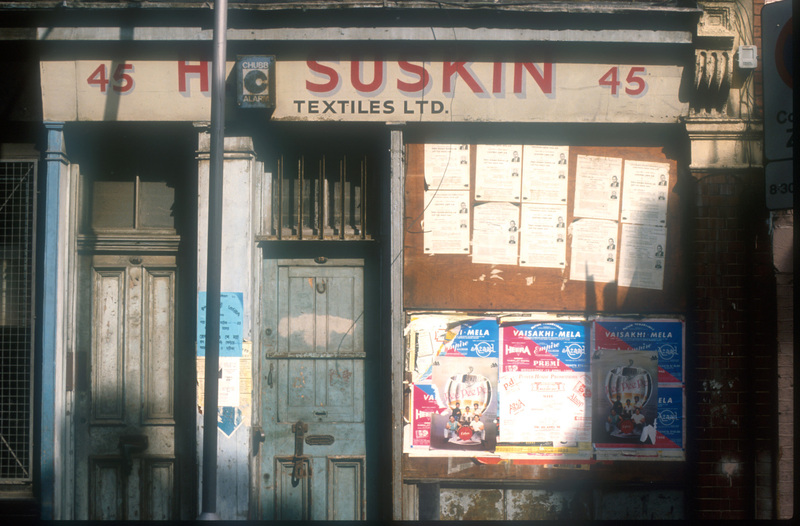 There’s a shop where I used to live in Barking, that was on a corner of rows of houses, with no other shops around. It’s always been boarded up as long as I’ve seen it and it has no signs but in my mind’s eye, it looks as though it may once have been a bakers and I like to imagine it in it’s former glory. 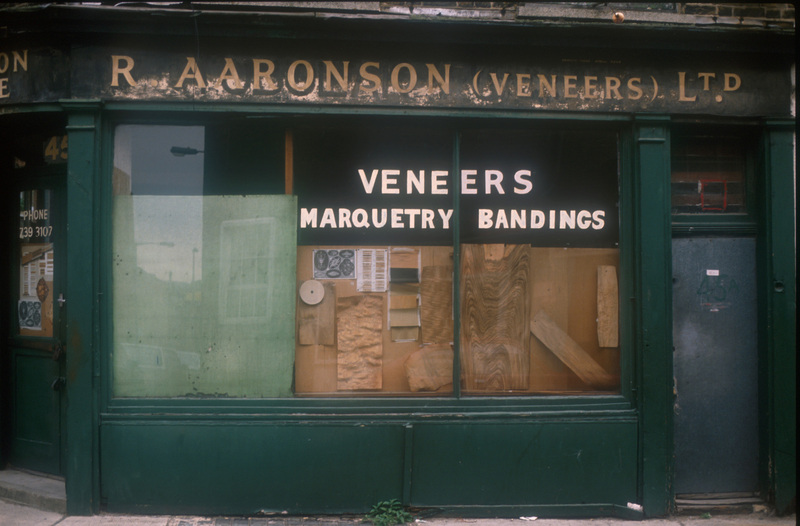 I was particularly interested in the shopfront photos as I was hoping to find something I’ve never seen before. Someone in my family history was a pharmacist/druggist at 258 Mile End Road in the 1890s and on my investigations through the area, it’s not there and appears as though the building was demolished – but I’ve absolutely no idea when. The local history archive has no photos of that area either so I guess I will never know what it looked like – although I haven’t given up trying! How can one not delight is these images. 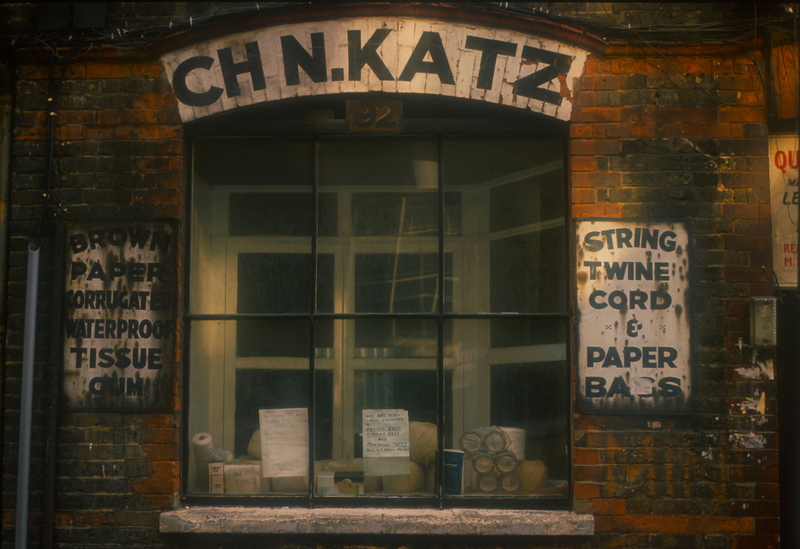 I didn’t know the East End, but I know from my London rellies that it held such life, such stories & these shopfronts seem to speak to us of the people they held long ago. It’s very important not to lose our history. Thank you for making this available to those of us far from London. I write from New Zealand. Wonderful! 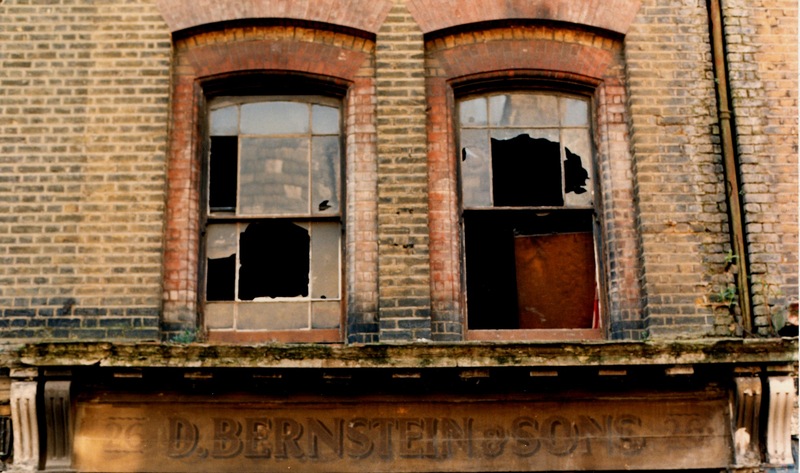 I am desperately seeking photographs of the Zeegen Brothers’ cigar factory which was located in Chicksand Street, off Brick Lane. The factory ceased trading in the 1920s, I believe, but the derelict (?) building was to be seen for some years thereafter, bearing the title ‘Zeegen Brothers’ on the wall. Lovely photos. 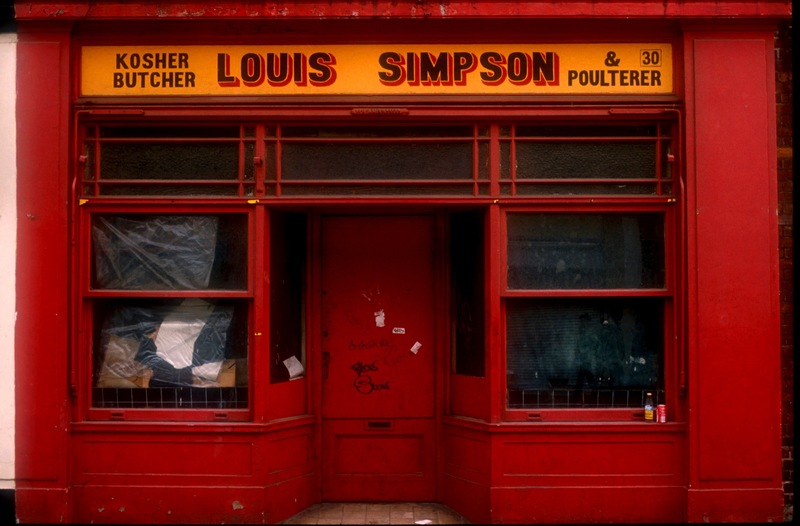 So thrilled to see my Great Uncle Laurie’s shop here ( Louis Simpson) . The conversations that this site has prompted with my parents have been a delight. Having been in the East End today I know how few reminders of this once vibrant community are left. FAO Chrissie, re your hunt for 258 Mile End Road. 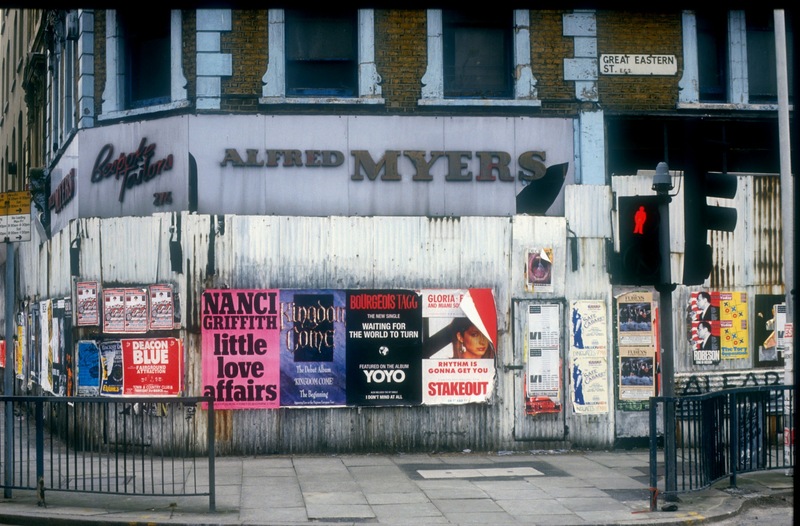 A number of the locations photographed by Alan in 1988 were on Mile End Road, and as research for our current exhibition of this collection of Alan’s photos, we at Tower Hamlets Local History Library & Archives ploughed through the many boxes and press cuttings relating to Mile End Road that are held at the library. If 258 was once situated near on the corner with White Horse Lane, as Google Maps suggests, it is likely it would have become part of the Ocean Estate which was built in the early 1950s after this part of Stepney was badly bombed during WW2. You should be able to identify at what point the shop closed (or changed ownership) by looking through the Kelly’s trades directories for each year, and you should also be able to identify the exact location of 258 Mile End Road on our collection of historic maps. All of these sources can be consulted at the Local History Library & Archives on Bancroft Road, E1. How wonderful to see these photographs. 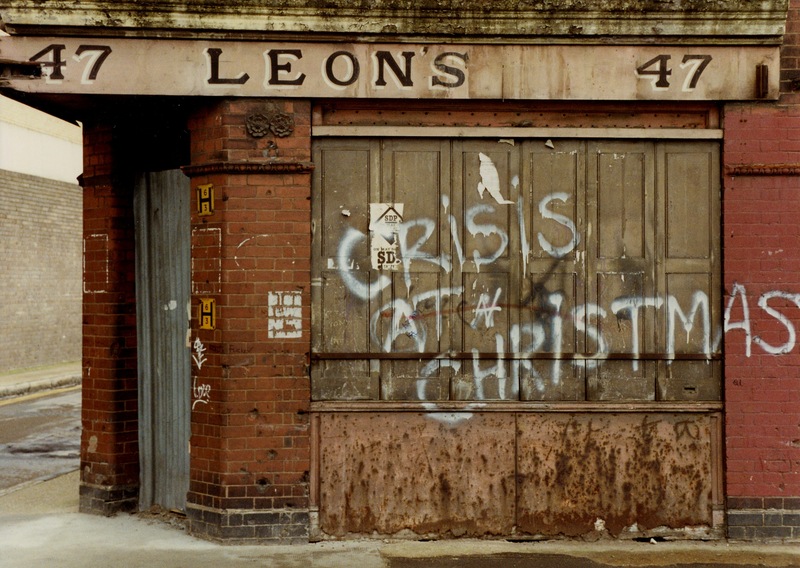 I grew up in the East End of London and these photographs have brought back some fantastic memories. With the aid of these pictures I have been able to pass on valuable history to my children and hopefully my grandchildren. Lived a couple of doors down from leons shop’ sometimes used to climb over back wall to pinch a bottle of lemonade. Left the street when I was 10 . Went back years later and confessed to leon. He told me off! My grandparents, Lewis and Dora Silver(man) had a grocery shop on Amhurst road, Hackney. Does anyone have a photo of that shop? Thanks. Gentle Author: I look forward to these missives every day. I was sorry not to see any pictures of Black Lion Yard frontages. My father kept a dairy there, and we had big red doors at the entrance to the dairy with the words J D & J Evans, Cowkeepers & Dairymen and beneath the same notice in Hebrew. Up until the end of the war my parents kept 40 cows there so that we could supply fresh Kosher milk every day. A man from the Beth Din – a Mr. Harris – used to come and supervise the milking and then put a Hebrew label on the bottle – they used to have cardboard stoppers in those days – to prove that the milk was genuine Kosher. The Jewish customers taught my mother to make cream cheese, Smetana (what we now call soured cream) and how to pickle cucumbers. We were the only people who had refrigerators, so we were always storing Eastern European delicacies for customers.